The use of stroboscopy in the voice clinic has been associated with an improved knowledge of the dynamics of voice production and has had direct payback to patients in the development of microsurgical techniques capable of preserving or reconstructing the essential features of the delicate vibrating structures which are responsible for the generation of good voice. The Lx Precision Stroboscopy program (LxStrobe3) is an enhanced version of the Lx Digital Video capture program which intelligently controls the Lx Light Source and provides the extra precision and additional benefits of a state of the art software controlled stroboscopy system. Lx Precision Stroboscopy has been optimized for obtaining stroboscopic sequences for even the most difficult subjects with fast capturing, reviewing and animating options. Precision synchrony with triggering waveforms permits greater security in the interpretation of the images. No change in colour balance between continuous and stroboscopic light. Cross correlation of Stroboscopic and Lx (EGG) and speech processing techniques and measures. Speech Studio, a connected speech analysis and outcome measurement system, can be added as a software option. Triggering from Speech or Laryngograph® signals. Instantaneous tracking of fundamental frequency and, period by period (unsmoothed) calculation of triggering point under DSP control. Synchrony markers linking image and Lx or Speech cycle and phase. The complete acoustic waveform for the entire captured sequence can be viewed with the precise period and phase at which the corresponding images were taken. This permits critical evaluation of the validity of the stroboscopic sequences and gives a context for the interpretation of images sequences, even where vibration is irregular and stroboscopic motion gives a false impression of the real motion. The eight images are automatically selected and displayed with the associated flash marker on the Laryngograph® waveform. Cycling through the image sequence provides a full screen, slow motion animation. The number of images chosen to represent one cycle can be set in software. 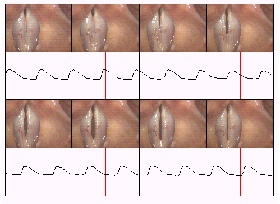 the mucosal wave, vocal fold symmetry, amplitude, periodicity, and completeness of closure can be observed.